Toot toot! Hear that? I was pretty sure that was the whistle blowin' on the train headed for Blandville. 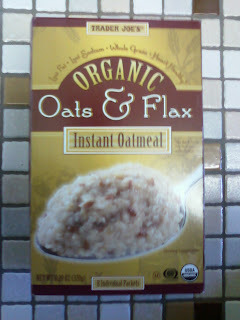 And I was pretty sure this Oats and Flax nonsense was going to be my ticket there. However, I wound up in a much more pleasant town. We'll call it Tastyburg. Mayor: Trader Joe, Points of interest: flavor and whole grain goodness. Silly, I know. But it's high time we reviewed this oatmeal. Sonia's been eating it for months now. I was a little reluctant...a little scared even. I just tried it for the first time today, and I was pleasantly surprised. Sonia and I both make ours with milk and water, although the box only calls for water (Who makes oatmeal with just water? Blech.) Texture-wise, it's got enough body to keep your teeth busy; it's not just a bunch of mush. There's a pleasant mix of flax seeds in with the oats. It's "hardy." ...or is it "hearty"? Well, it's one of those...you get the idea. The flavor was what I was really worried about. I like brightly-colored, fancy oatmeals and breakfast cereals with fluorescent, fruit-shaped pieces made of high-fructose corn syrup and partially-hydrogenated oils. But it is the new year and that resolution about being healthier is still fresh in my brain, so I braved the oats and flax. It was surprisingly sweet. They do add cane juice solids to liven it up a bit. It was a little nutty, too. It reminded me of the maple and brown sugar flavored oatmeal that Quaker offers, but I actually liked this one even more. It made me feel all warm inside and gave me a good start to the day. If that Wilford Brimley guy had ever tried this stuff, he surely would have ditched Quaker and started doing commercials for TJ's brand. Is he still alive? C'mon, somebody get Wilford Brimley's agent on the phone! Anyway, Sonia gives it Four and a half Stars out of Five. I give it Four out of Five Stars. Bottom line: 8.5 out of 10. What a great blog! TJ's is one of my primary grocery stores. I've moved away from instant oatmeal, but I'm glad you're enjoying this one; flax is really good for you -- we add to our oatmeal, pancakes, smoothies, etc. and we can't even taste the difference.